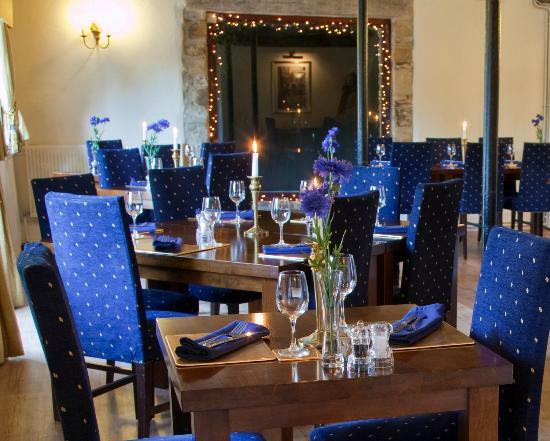 The Wheelroom Restaurant is small but beautifully appointed with ample space for 40 people. A light and airy room by day, the Wheelroom with its flickering candles is transformed into a romantic evening setting with soft music by night and the constant turn of the waterwheel behind the glass partition enhances your experience whenever you dine. Tables can be arranged to suit your needs, so whether eating alone, as a couple or with a party of family or friends the Wheelroom can accommodate you. Your welcome at the bar is second to none, choose your dishes from the a la carte menu or specials board, then wander down to the Wheelroom where our fully trained, attentive but unobtrusive waitresses will look after you from starters to coffee and liqueurs.